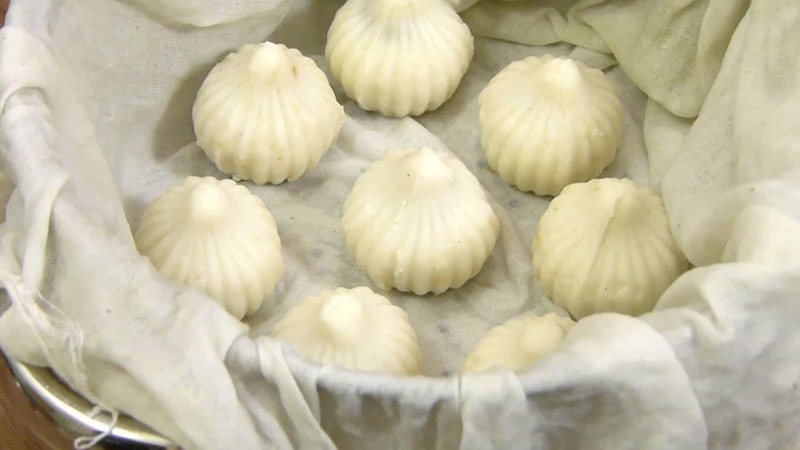 Modak is a divine sweet, offerings to lord Ganpati during the time of Ganesh Chaturthi festival. Ganpati is very fond about Modaks and it is most important offerings made to Lord Ganpati by his devotees. 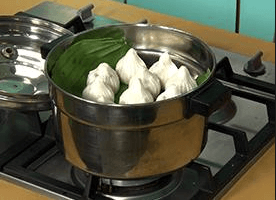 Today we are going to cook Ukadiche Modak Recipe also known as steamed modak with step by step photo guide. 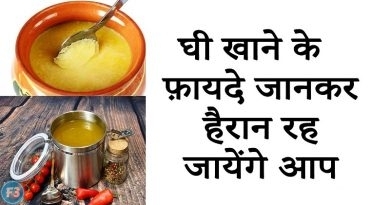 No wonder it’s the god’s favorite Modak Recipe. A famous Indian dessert consumed highly during the festival of Ganesh Chaturthi Modak Recipe. 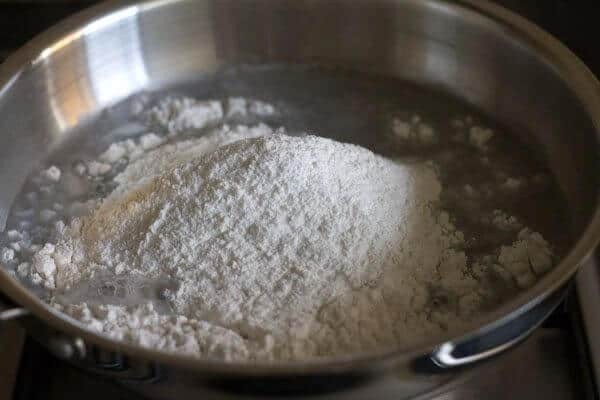 Place the rice flour in a deep bowl and add the boiled water. 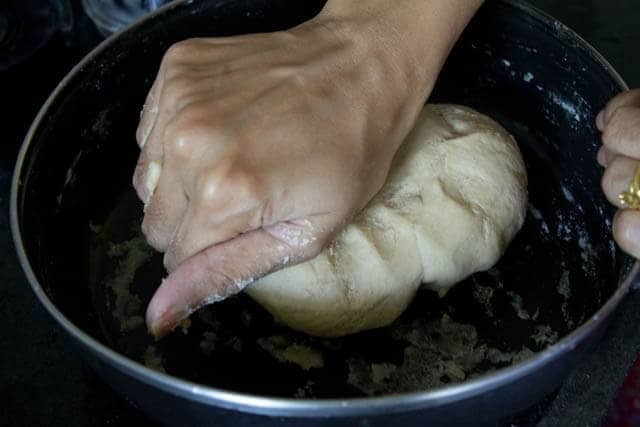 Mix well using a spoon in the beginning and then knead into soft and smooth dough. 3. 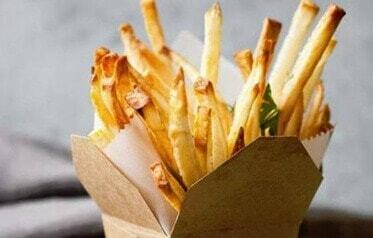 Cover with a lid and keep aside for 10 minutes. 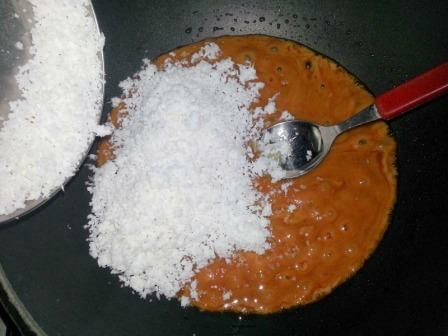 2.Add the coconut, poppy seeds and cardamom powder, mix well and cook on a slow flame for 4 to 5 minutes or till all the moisture evaporates and the mixture thickens. Keep aside to cool slightly. 3. 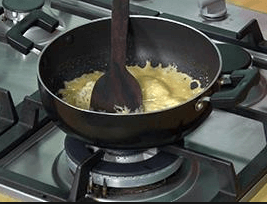 Divide the filling into 21 equal portions and keep aside. 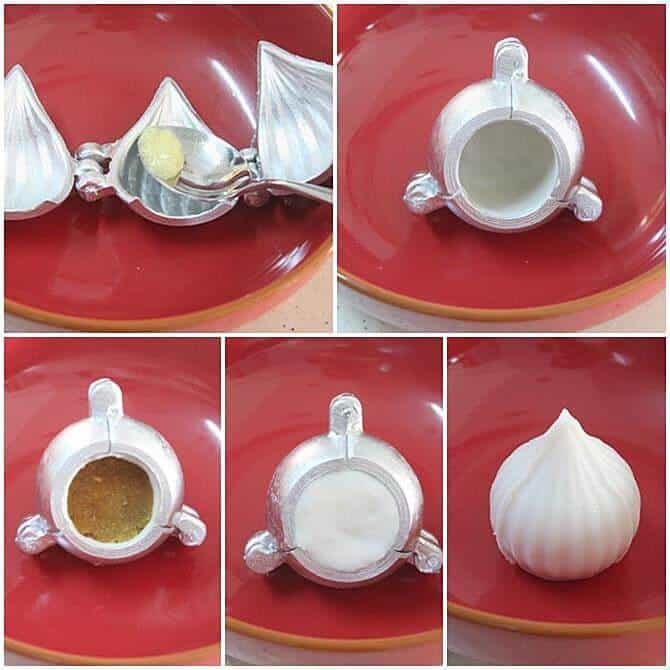 2.Grease a modak mold using very little ghee and close it. 3. Take a portion of the dough, press it into the cavity of the modak mold till it is evenly lined on all the sides. 4. Fill the dough cavity with a portion of the filling. 5. Take a smaller portion of the dough and spread it evenly at the base of the modak mold so as to seal the filling. 6. Demould the modak from the modak mold. 7. Repeat steps 2 to 7 to make the remaining 20 modaks. 8. Place a steamer plate in a steamer and place a banana leaf on it. 9. 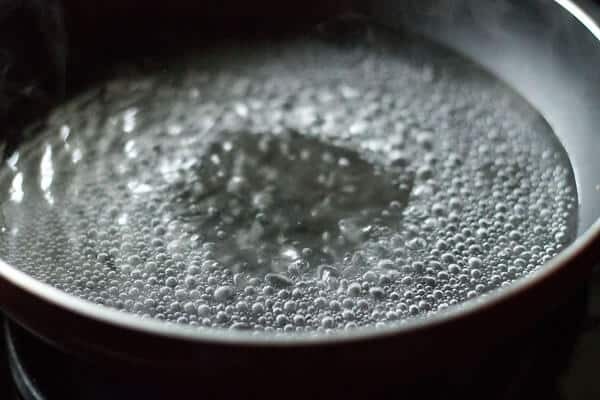 Moisten all the modaks with little water using your fingertips. 10. Place 10 modaks on the banana leaf and steam on a medium flame for 10 minutes. 11. Repeat step 10 to make 11 more modaks in 1 more batch. 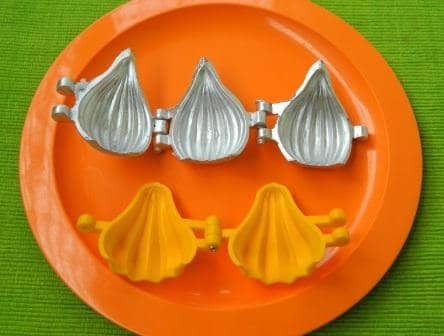 Modak molds are easily available in local “steel utensils and appliances” shops. 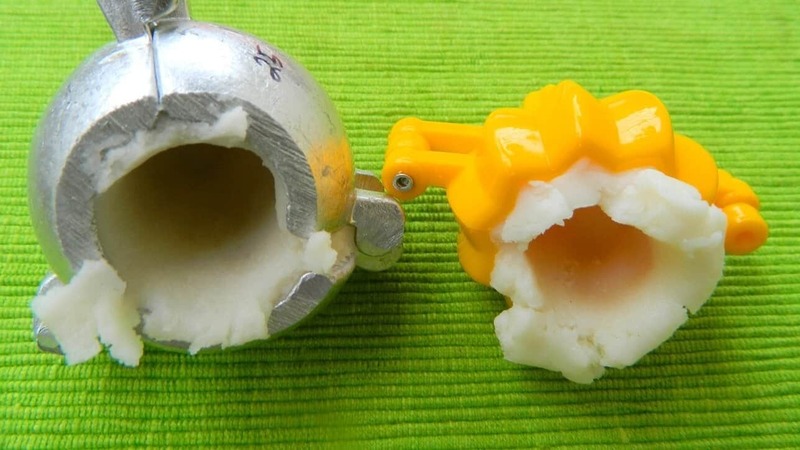 Two types of molds are available i. e. Plastic and stainless steel. Plastic molds range between rs. 10 to rs. 30. Stainless steel molds range between rs. 40 to rs. 70.